The SFF-8088 Mini-SAS connector is designed for implementing Mini SAS External interconnect solutions. The SFF-8088 is a 26-pin ‘Mini SAS‘ connector, and utilizes a metal outer shell compatible with shielded external connections. Typical application would be a SAS link between a SAS HBA to a SAS drive subsystem. The SFF-8088’s Mini-SAS internal counterpart is the SFF-8087 which is also Mini-SAS 2.0 compliant, and also supports 6Gb/s SAS data transfer speeds. Both the SFF-8088 and the SFF-8087 can support up to 4-ports (4 lanes) of SAS data. 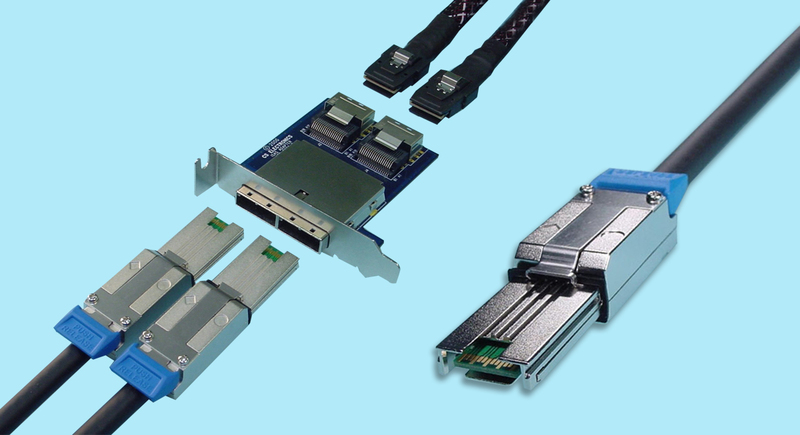 CS Electronics has incorporated the SFF-8088 connector onto both cable assemblies and pcb adapters. The new generation HD Mini-SAS 3.0 SFF-8644 and SFF-8643 HD SAS connector interfaces have essentially replaced the SFF-8088 external and the SFF-8087 internal SAS interfaces, however CS Electronics continues to support our customer’s needs to preserve existing SAS architecture for older interface cables and adapters.